Denmark, Finland, Iceland, Norway and Sweden, commonly known as the Nordic countries, have been leaders in the development of modern family and gender policy, and the explicit promotion of gender equality at home, at work, and in public life. Today, on many measures, they boast some of the most gender-equal labour markets in the OECD. 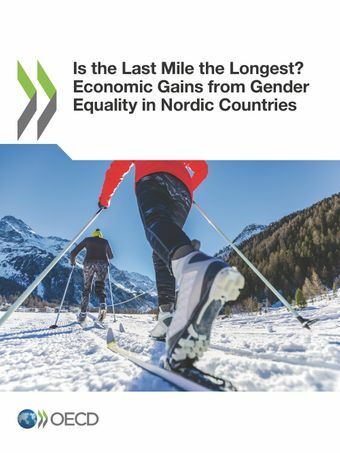 This report shows that improvements in gender equality have contributed considerably to economic growth in the Nordic countries. Increases in female employment alone are estimated to account for anywhere between roughly 0.05 and 0.40 percentage points to average annual GDP per capita growth – equivalent to 3 to 20% of total GDP per capita growth over the past 50 years or so, depending on the country. The Nordic countries are closer than most to achieving gender equality in the labour market. But the last mile may well prove to be the longest one. To make further progress, a continued assessment of the effectiveness of existing public policies and workplace practices is needed. Only with resolve and a continued focus can Nordic countries ensure that men and women contribute to their economies and societies in gender equal measure.